Calling all Zuni Mountains Collaborative members! Join us in Grants on Wednesday March 13th for a very important multi-party monitoring meeting. Almost 8 years into the project we know there has been a lot of good monitoring and learning happening and we need to share, talk, and learn! As you all may have heard, the Collaborative Forest Landscape Restoration Program (CFLR) was re-authorized in the latest Farm Bill. To best position ourselves to pursue a continuation of funding for the Zuni Mountains CFLR in the Puerco Project Area, we will need to review and update the project monitoring plan. The Zuni CFLR landscape includes multiple land tenures, ecosystems, and wildlife etc. that may be under the jurisdiction of multiple agencies to monitor. If your organization has collected ecological or socio-economic monitoring data (vegetation, water quality, wildlife, employment etc.) in the Zuni CFLR landscape please come prepared to discuss your monitoring plan and any results, analysis, and reports you may have. Please use the form below to RSVP for the meeting. The Mt. Taylor Fire & Fuels Crew at work. Photo: Chris Baca. 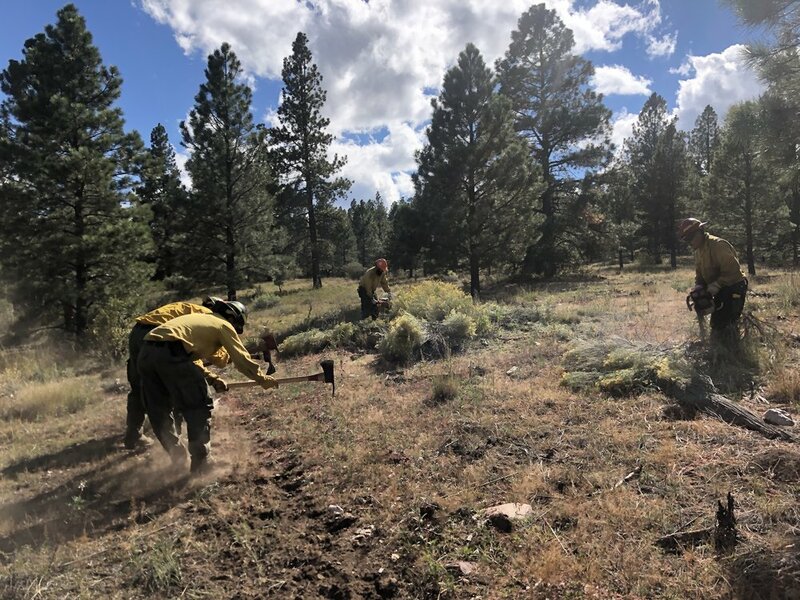 The Forest Stewards Guild was recently awarded a Collaborative Forest Restoration Program (CFRP) grant to build capacity for prescribed fire in the Zuni Mountains. The project proposal is available here. Project partners are convening a kick-off meeting on Friday, February 15th at the Mt. Taylor Ranger District Fire Center in Grants from 10:00 – 12:00. At this meeting we will review the project intent and discuss how we will collaborate to accomplish the project deliverables. Please use the form below to RSVP for the meeting. i.e. Mt. Taylor Ranger District, Forest Stewards Guild etc. There will be a community meeting about the Bluewater and Diener Canyon fires on Tuesday, April 17th at 5:30 p.m. in the auditorium at the old county complex at 515 West High Street in Grants, NM. Incident management team personnel and fire cooperators will provide an update on these two fires. Landscape scale forest restoration in the Zuni Mountains: Restoring what, to what? For more than a decade, The Forest Stewards Guild has been working with a diverse group of partners to restore resilience to forests in the Zuni Mountains of western New Mexico. What does a resilient forest look like and why might it have needed restoring to begin with? These are some of the questions that Matt Piccarello, Southwest Assistant Director for the Forest Stewards Guild, will answer in a presentation that will explore the history of land use in the Zuni Mountains and recent efforts to restore resilience to forests and the communities that depend upon them. 0900-1530. Meet at the Flying J, Exit 39 off of Interstate 40, approximately 42 miles west of Grants, NM and assemble into passenger vans before setting out. We will be visiting numerous sites to view existing conditions and discuss needs for change and proposed treatments. Please bring a bagged lunch. Light refreshments provided. Bring appropriate clothing, including a rain jacket, boots, water, food, and sunscreen. Please RSVP to Shawn Martin, samartin@fs.fed.us by June 2nd if you would like to attend. The April collaborative team meeting will cover important topics including NEPA analysis for the Rio Puerco portion of the CFLR, the future of collaboration in the Zuni Mountains, and updates on monitoring, outreach, and the status of restoration treatment implementation. Please RSVP to matt@forestguild.org by Friday, March 31st if you plan to attend so that we can provide lunch for all participants. Please indicate if you have any dietary restrictions. Join us for the Shared Stewardship Collaborative Meeting on January 10th in Grants, NM. January 10th, 2017 - 5:00 PM at the new Cibola County Building on Roosevelt Ave. in Grants (next to the Smith's grocery store, which is at the corner of Roosevelt and Lobo Canyon Rd). The agenda and notes from the June 30th all lands implementation strategy meeting can be accessed through the following links: agenda, notes. The landscape restoration strategy embodied in the Zuni Mountains CFLRP is essential to accelerating the Cibola’s restoration efforts while stabilizing local wood manufacturing industries and creating jobs. Planning at the multiple watershed level, the Zuni Mountains landscape strategy approaches forest restoration and economic development at a scale that achieves meaningful ecological, social, and economic results across jurisdictional boundaries. The project plan identifies a land base anchored by prioritized national forest system land in need of restoration and adjacent high priority tribal, state, and private land holdings. Tribal participation is essential to ensure program success. The Tribal Partnership meetings are a critical tool to encourage tribal participation. In an effort to establish meaningful, on-going relationships and the development of future collaboratives, the Forest Stewards Guild hosted a series of meetings in early May of 2016 with representatives from the Cibola National Forest and five tribes directly impacted by the program (Baahaali Navajo Chapter, Ramah Navajo Chapter, Pueblo of Zuni, Pueblo of Laguna, and Pueblo of Acoma). Below are the notes from those meetings. The notes from the May 3rd and 4th tribal partnership meetings can be accessed here.